Early uses of augmented reality (AR) and virtual reality (VR) have been noted since 2012, but its use has been on the rise particularly this past year through applications in immersive journalism. TechRepublic summarizes its potential when they say that VR will not only bring change to the media industry but also to the future adoption of technology. It is the next step towards building audiences better and creating empathy for stories and events that are far away. One must acknowledge the ethical considerations and how to best present the story in an objective manner, however, depending on its application, VR & AR can be a tool to sensitizing readers to engage with new formats like print and TV did during its heyday. The technology is already here, the tools are accessible, and the entry point barrier is getting lower every day. This article reviews some of the tools that are available and in use across newsrooms. ZapWorks provides content creation tools – widgets, designer and studio in order to create multi scenery experiences, and 3D interactives or AR powered video. It has been called the QR code on steroids and has won Best Authoring or Publishing Tool at the 2017 Auggie Awards. In the example below, Seth Colaner of Tom’s Hardware has been shown to have created a widgetized app of the Nexus keyboard they were reviewing back in 2016, whilst providing an accompanying review article. Reynolds Journalism Institute recently featured Seth in a video where he speaks about other AR tools and other examples of using ZapWorks for creating experiences. 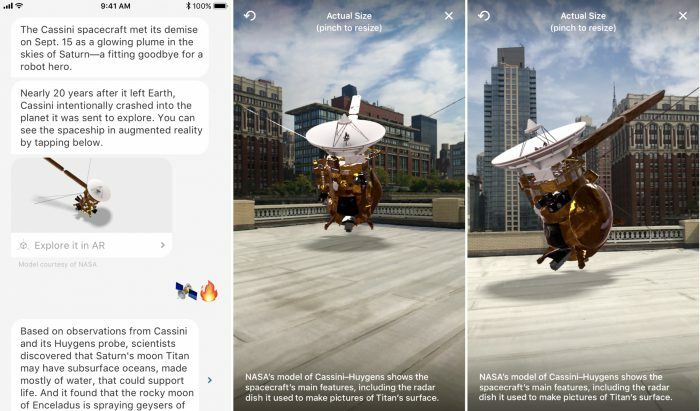 321 Launch is a VR app in collaboration with USA Today and Florida Today for science and space news content (note: Thanks to Veronica Magan for sharing this article). Ray Soto, director of emerging technologies at USA Today Network, has outlined the further use of creating more ARCore related apps with its network partners for local news experiences. Apple ARKit is a software development kit for developers to make augmented reality apps for iPhone and iPad. Quartz uses AR to illustrate some of its stories. For instance, as mentioned in Nieman Lab, its coverage of the demise of the Cassini spacecraft is joined by a 3D model of the ship that users can examine as if it was physically in the same room with them. Earlier this year, Apple announced the newest version of the ARKit which has the ability to sensor objects vertically (Google’s ARCore still senses objects horizontally). This latest update has delivered a feeling of contentment among users. A YouTube app allows you to find and watch 360 videos and virtual reality content with certain headsets and devices. The Daydream platform and Oculus headset received a warm response, whilst its launch on Steam in December 2017 was met with mixed responses. Applications of YouTube VR include the Seeker VR YouTube channel, which already has 20 immersive videos and over 34,000 subscribers from the past year. Some of the more popular videos include Journey to the Edge of Space (3.9 million views) and Surfing 101 (288,000 views). The other videos range from 2,000 views to 27,000. WITHIN is a virtual storytelling app that brings together VR premium content in a variety of genres. WITHIN has partnered with The New York Times, NBC, VICE, United Nations, U2, Annapurna Pictures, Conservation International, and Charity: Water and Apple to produce and distribute content. In 2015, VICE (who’s also an investor in the company) produced their first-ever VR news broadcast – the Millions March in New York City, as 60,000 New Yorkers protest racial profiling by police. Vice’s Alice Speri reports from inside the protest. Google’s VR platform, Google Cardboard, can be considered as one of the lowest-tech VR in the market and has resulted in a succession of new products and integration with other hardware from the search giant. Once you put your viewer together, download its accompanying apps and slot in your smartphone to do a range of things such as playing immersive games, visiting places, and engage in interactive viewing. Introduction to new technologies by leveraging existing channels of distribution can be a solid approach to capturing new generation or segments of users. The New York Times’ experiment to ship 1 million Google Cardboard products in 2015 made its foray into the digital media publishers’ space and has been a leader ever since. The New York Times has continued to build its VR library in its app and expanding into Daydream and Samsung Gear VR. OmniVirt claims to be the largest premium VR ad network. They’re providing several products towards helping create, play, distribute, and promote VR branded content. From Euronews embedding an OmniVirt video player in its Svalbard Seed Vault story to brands placing video advertising across publisher mobile, desktop, in-stream, Snapchat and Twitter profiles, OmniVirt also supports managing immersive journalism experiences and customizable virtual marketing campaigns with their supported analytics suite. They offer several 360 video case studies from publishers that you can watch and read more. HTC’s Vive headset and the system have been predominantly used for gaming publishing to date. However, there have been many steps taken to make this more mainstream in media publishing. Firstly, the integration with the WITHIN app and Facebook has allowed the NBC, Vice Media, The New York Times, and other publishers to create interactive experiences and news. In March 2017, the company launched VR Ad Service which enables developers to insert ads into VR content. In April 2017, HTC Vive has also introduced a subscription model for users to experience five pieces of VR content for a set fee per month. Insta360 Nano – The Chinese startup has created a double-sided mobile attachment for mobile phones in producing 360 VR experiences. They also offer automatic social sharing and live streaming integration with the main social media players. Snapchat Lens Studio – The social network that has been responsible for popularizing augmented reality, Snapchat Lens studio is another self-serving AR tool that allows you to create lenses for Snapchat posts, ads, and more recent events. Publishers using Snapchat Lens would still have to promote their own lenses by marketing their own Snapcodes that users scan to unlock for 24 hours. Snapchat currently offers world lens (which is a lens for objects) and face lens. Samsung Gear 360 – It’s a first hardware with two cameras to take 360° photos and videos. In 2017, BuzzFeed and NowThis partnered with Samsung as part of a joint effort to deliver more interactive storytelling with how-to and news content for audiences using virtual reality (VR). Facebook Spaces & 360 – Using Oculus Rift and HTC Vive, people can interact with friends in a virtual reality environment through Facebook Spaces (in beta). Publishers like CNN VR and The National Geographic have been adopters of Facebook 360 as supplementary support for their news and documentary coverage. Twitter – At the end of last year, Twitter introduced a live 360-degree video streaming service via Periscope. There hasn’t been much coverage on publishers using this feature directly, though. How do you consider your audience consuming AR/VR content? What are some of the tools, frameworks and use applications you adopt in your newsroom for immersive content? Please leave your thoughts and comments below. Note: The header image for this piece has been created by Robert Hernandez, USC Annenberg Digital Professor that appears on his Medium post here.